We’ve put together a list of the top five things that homeowners can do to make their house more sustainable. This list focuses on reducing your energy use (and your energy bills! ), which will reduce the amount of fossil fuels (like natural gas), and thereby reduce harmful greenhouse gas emissions causing climate change. Having an airtight house is the best way to save on energy bills, and the biggest bang for your buck. Up to 40% of heating and cooling can be lost to gaps in the air control layer (air barrier system) and drafty walls. One way to improve the airtightness of your house is to install caulking and weatherstripping in the gaps around windows and doors. These areas are the weakest points in the air control layer since they interrupt the continuity of the air barrier. If you think your house is already airtight, get a blower door test done. This test will reveal any gaps where air is leaking through your walls and give you the opportunity to fill them. Windows and doors are also the weak points in the thermal control layer (insulation) of your house. Glass, wood, vinyl, and metal are all naturally poor insulators and are typically what your windows and doors are made of. But we can’t get rid of windows and doors completely so we recommend higher performing windows, such as triple-glazed with fiberglass frames, and doors with insulated cores. These windows and doors are probably better than your current ones, especially if they are old and haven’t been replaced in a long time. By replacing your windows and doors, it gives you the opportunity to install some of that caulking and weatherstripping we talked about in #1. Add insulation, especially in your attic. We know that warm air rises, and heat moves from warm to cold, so if your attic isn’t properly insulated you are losing huge amounts of heat through your ceiling. Attics are easily accessible and fairly simple to insulate; make sure to use insulation that will harmlessly allow moisture to dry out. Similarly, your basement floor and walls, which are constantly in contact with the cold ground, are likely losing large amounts of heat if they are uninsulated. These areas aren’t as easy to access, however, if you ever have to repair your drains or dig up your basement floor, this is the ideal time to add insulation under and around the edges of the floor slab. Installing low-energy LED lights and Energy Star kitchen and laundry appliances will reduce your energy bills and contribute to significant savings over time. In addition, they use less water, providing savings on your water bill as well. When it is time to replace your furnace and air conditioning, choose energy efficient models and keep the filters clean! Clean filters means your furnace doesn’t have to work as hard to push the air through and air quality will be much cleaner and healthier. Check the filters every few months and clean them when needed. Overcladding refers to the addition of insulation and finishes (we recommend lightweight siding) to the exterior walls of your house. This is a big undertaking and will change the appearance of your house, but will provide you with the opportunity to insulate your walls without losing interior floor space, and allows you to add that continuous air control layer we talked about in #1. And if your house already needs a facelift, then this is a great solution. The added air control layer and insulation could save as much as 50% on your energy bills and provide you with a better performing and comfortable home. 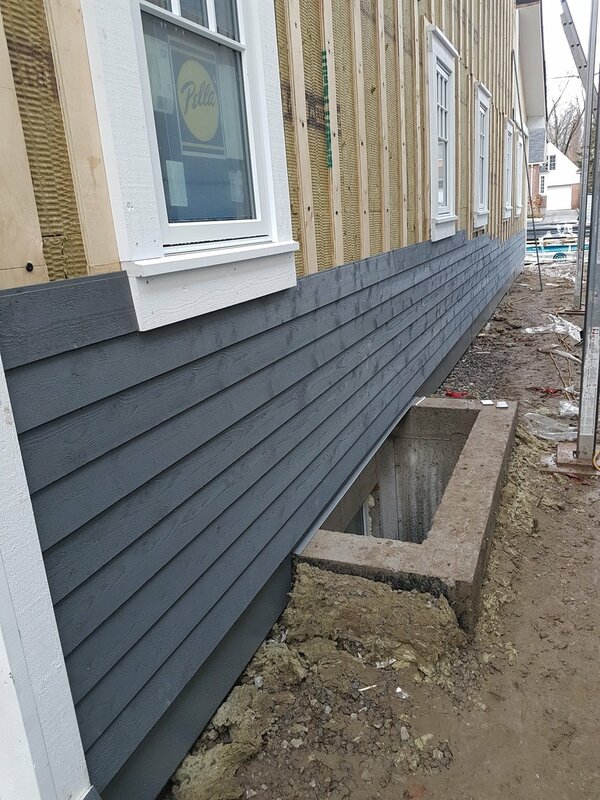 Wood siding over exterior mineral wool insulation. If you’ve completed numbers one through five and you want to do more, you’re now ready to look at the tools that will help you switch off of fossil fuels. We’re talking about solar panels, geo-exchange systems, Tesla Solar tiles and house batteries. By switching to renewable and fossil fuel-free sources of energy, we can further reduce our impact on the environment and stop contributing to climate change.